Throughout 1968, myriad significant events happened worldwide that are now immortalized by history, among them the assassination of Robert F. Kennedy and Rev. Martin Luther King Jr. US African American athletes John Carlos and Tommie Smith, took a stand against racial discrimination during the 1968 Summer Olympics in Mexico City by bowing their heads and each raising a black gloved fist, an act that created waves of support and opposition. When I heard the news that day, oh my, my pen simply went silent, recalling Walter Benjamin. In May 1968, France was the scene of a social revolution against de Gaulle’s authoritarianism, particularly the hypocrisy behind economic growth, social conservatism, and a national education policy that left students without employment opportunities or if employed, as assistant professors with uncertain career prospects. Similar demands echoed across many other places, such as Germany, Czechoslovakia, Italy, Canada, the United States, and Mexico, each expressing their own local concerns. These voices—characterized as insurgent, anarchist, or communist by repressive governments or social conservatism—triggered the unleashing of the intimidating presence of the army on the streets of Chicago, Mexico City, and Prague. 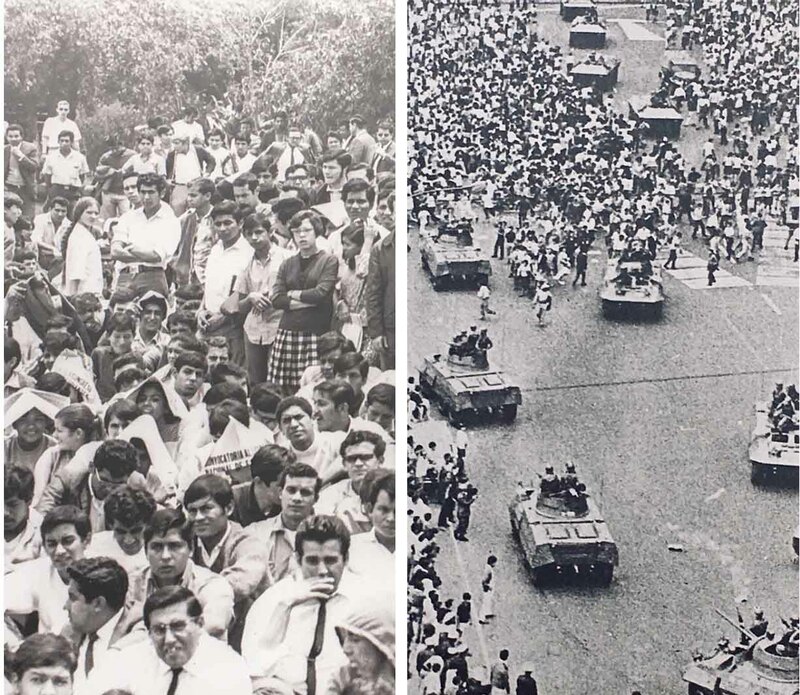 Amid these notable and well recorded incidents, another momentous and violently suppressed protest occurred ten days before the opening of the 1968 Olympics in Mexico City. The world, however, has hardly any memories of what happened during the brutal and cowardly massacre of an unknown number of students at Tlatelolco, the open market where Conquistador Pedro de Alvarado massacred Aztecs in 1521. With the exception of Fournier and Martínez, analyzing what happened that day is not common in Mexican archaeology. I warn the reader about the graphic content in the existing filmography about what happened at Tlatelolco on October 2, 1968. 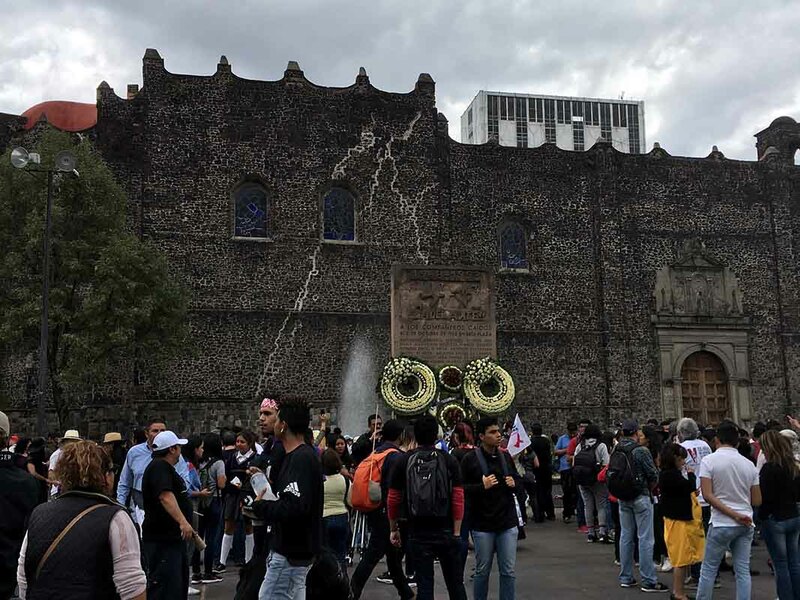 For fifty years, a memorial with flowers and an annual march from Tlatelolco to downtown Mexico City evoked the massacre that took place that ill-fated day (Figure 1). After being brutally crushed, Mexican society knew the movement had to end and proceeded to a new chapter in Mexico’s history, the Olympics, and from there, fear and apathy took over. I concur with Deleuze and Guattari, who pointed out that the inability of French society to assimilate what had happened in May 1968 promoted the idea that the revolutionary movement in France was over. My choice to write about the students’ movement in Mexico for my first contribution to the AD Section News column expresses both my concern about making self-evident what archaeology can contribute to anthropology, my desire to question the recent strategies by the government to construct a national truth of the massacre, and my interest in showing how the Tlatelolco Massacre has been reborn in the cradle of Mexican history as intangible cultural patrimony. On September 3, 2018, motivated by their discontent with their high school authorities, students protested on the main esplanade of Mexico’s National Autonomous University (UNAM). The attack of these students by repressive forces of unclear origin, closed down UNAM and several of its faculties, events that brought back memories of what was once forgotten (Figure 2). In 1968, a single political party had governed Mexico and its traditional Catholic society for almost four decades. Mexico became exposed to an alternative society developing in Europe and the United States that searched for the political truth behind the conditions of the working class or the legitimacy of the Vietnam War. For Alain Badiou and Jean-Paul Sartre, the political stance opened a field of possibilities and changes that promoted freedom of speech and women’s rights. The stance, however, was answered by spaces of protest filled with teargas, tanks, and machine guns, but also the critical reflexivity behind the writings of Jean Genet, the Beat literary movement of Allen Ginsberg and William Burroughs, the counterculture movement that gave us “Born to be Wild,” “Jumpin’ Jack Flash,” “Hey Jude,” Janis Joplin’s soothing songs for peace, and the social consciousness behind graffiti and Warhol’s Brillo Boxes. Mexican society was no stranger to these happenings or the political movements taking place in other Latin American countries. The 1968 Mexican student movement was fighting for similar world-shared ideas, to be free of the authoritarian regime of the Institutional Revolutionary Party and of the many canons dictated by a traditional society (Figure 3). Who would knew the rivalry between high schools would end up in a public confrontation that ignited a forceful government reaction? This conflict became a political nightmare just a few months shy of the Olympics, the event that was to place (in a positive way) Mexico on the world map. Blinded by fear and pride, the government retaliated with military tanks, actions that infuriated students’ professors and parents as well as the working class society in general. These diverse constituents joined forces to organize a resistance movement. Living in Mexico City at the time was like being under martial law, as soldiers and tanks covered its streets (Figure 3). President Díaz Ordaz then made it clear he was going to restore order by all means possible. On September 18, the army occupied UNAM’s city campus and detained nearly a thousand students, right across from the new Olympic Stadium. In response, leaders of the student movement called a meeting at Tlatelolco on October 2, 1968. Thousands of students filled the plaza, unaware of their upcoming ambush. Military and police forces mobilized and surrounded Tlatelolco’s housing complex, their attack announced at 6:10 p.m. by the green flare lights launched from a helicopter flying over the plaza. Within seconds, the chilling sound of bullets revealed the presence of the armed forces and of skilled snipers on the roofs of the surrounding buildings. Military forces shot indiscriminately into the crowd in the plaza, including children. Disguising their responsibility, they even shot their own to justify their attack of a society, that even today, has no easy access to guns. Survivors were taken to an unknown location. Many never came back. By dawn, headline news had ephemeral notes about the confrontation between police and students at Tlatelolco. The bodies and those of the injured had been removed. Physical traces of this atrocity were erased, but not the memories of the survivors. On October 2, 2018, ninety thousand people headed to Mexico City’s downtown plaza carrying their memories and calling for the removal of plates commemorating President Díaz Ordaz. The subjective questioning of the political truth behind historical representations that have shaped our ideas and embedded us with a sense of historical belonging that was questioned that day by the placing of an anti-1968 monument (Figure 4). Earlier that day, Mexico City’s mayor signed an initiative to declare the massacre as part of the city’s heritage. 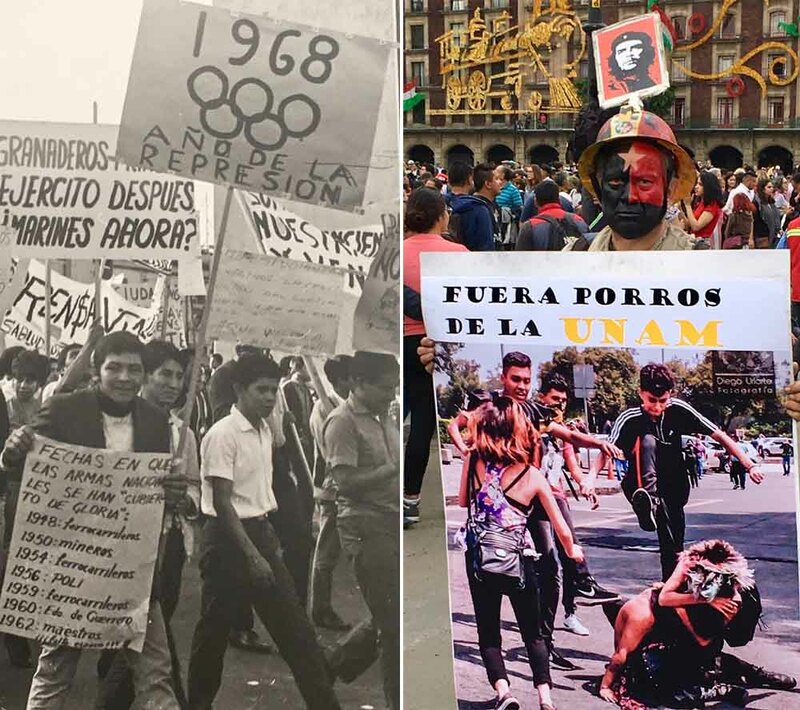 With the presence of President-elect López Obrador at Tlatelolco that evening, the 1968 student movement was officially inked in Mexico’s history books as intangible cultural patrimony. When I heard the news that day, oh my, my pen simply went silent, recalling Walter Benjamin. Society has just expressed the recognition of the past, but that does not mean acceptance of “how it really was.” It was another attempt by the government to take control of a memory in a moment in which national history is in danger and from which even the dead are not safe. Sandra L. López Varela is a member of the faculty of Philosophy and Letters at Universidad Nacional Autónoma de México and the Secretary for the Archaeology Division of the AAA.